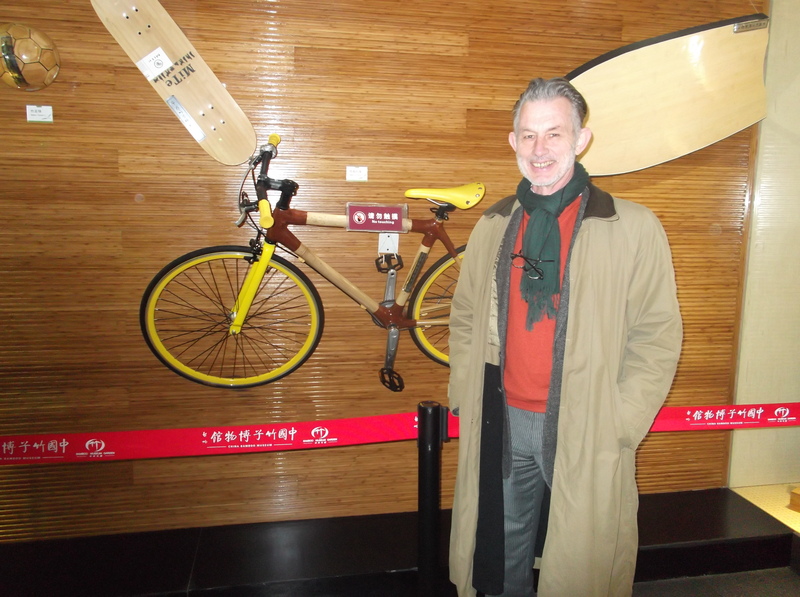 When I visited the Bamboo museu in Anji County, Zhejiang Province, China last week, I was photographed next to a bamboo bike. I know many people see bamboo bikes are a bit of a gimmick, but there are now a number of companies around the world that are producing bicycles made from bamboo. The arguments are that the bikes are made of a sustainable product, they are as sturdy as traditional bikes and they even feel more comfortable as the bamboo is slightly flexible and absorbs bumps and shocks better than a steel frame. I have never been on a bamboo bike, so cannot vouch for the reliability of these claims, but let me tell you about some of the activities that I am aware off. 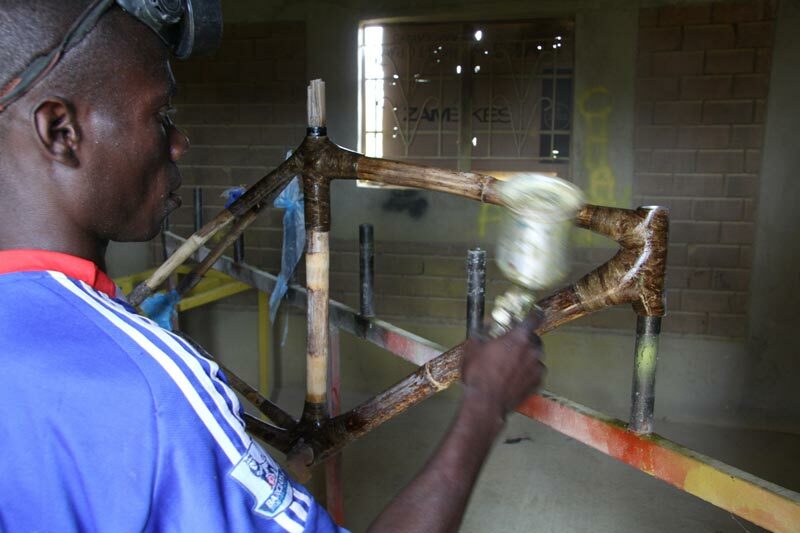 In Ghana there are at least two organisations making bamboo bikes. Bamboo Bikes Limited (BBL) is a Ghanaian owned manufacturing company located in Kumasi, which is where the INBAR Regional Office for West Africa is also located. According to their website, the principal aim of the company is to provide affordable transportation to many poor rural inhabitants who are denied access to market for their produce, face difficulty in reaching medical facilities and many other challenges as a result of inadequate or no roads. 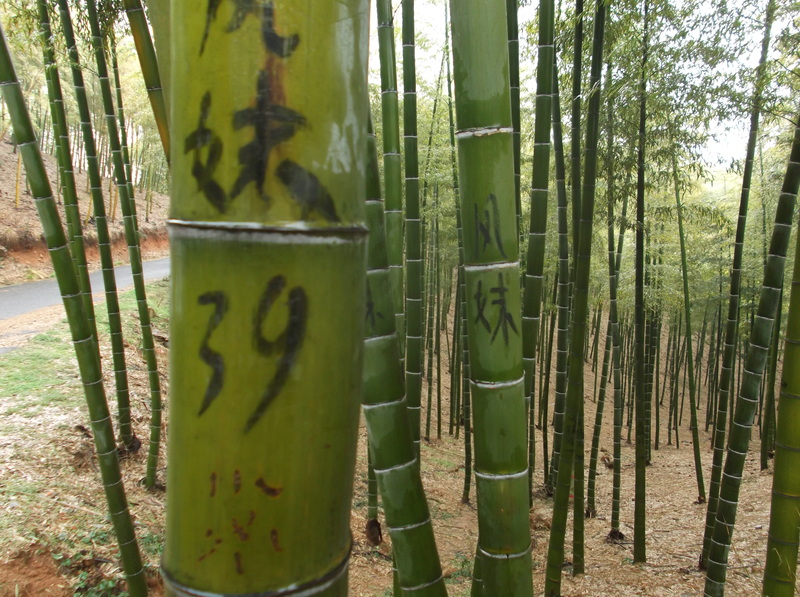 A fully grown bamboo tree has an average length of 16 metres, and their bicycle production unit uses only 4 metres of the pole for its production. BLL Ghana has therefore added a toothpick section to make use of the remaining two-thirds of the bamboo tree that would otherwise go to waste. The company employs 34 workers in the factory and also provides an alternative source of income for the communities where the bamboo is harvested. 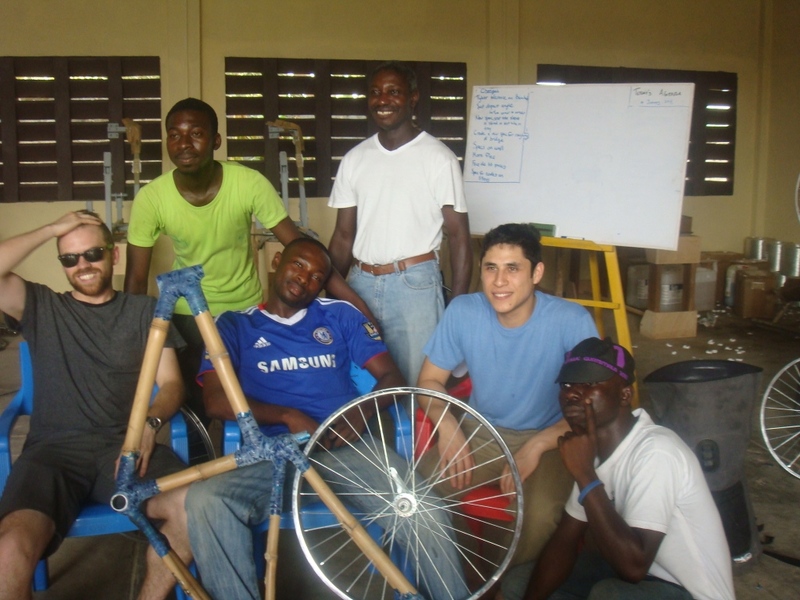 The other initiative in Ghana is the Ghana Bamboo Bikes Initiative. 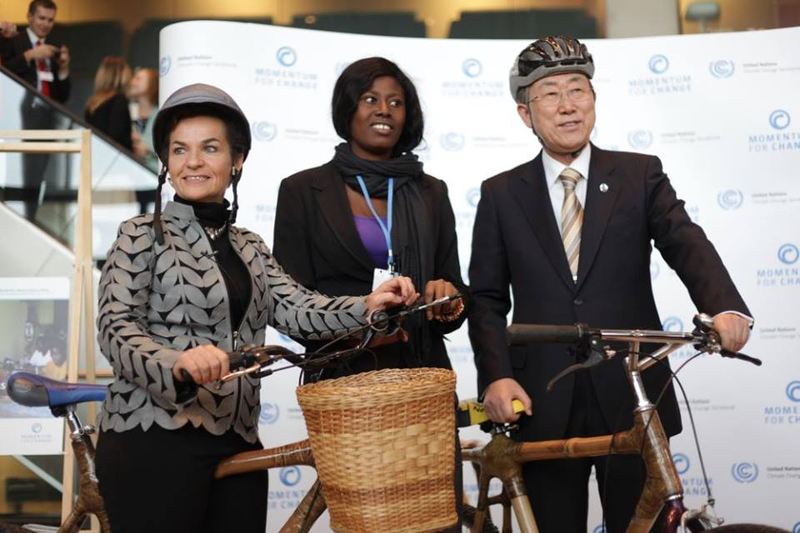 They had some unexpected publicity when United Nations Secretary General Ban Ki Moon sat on one of their bikes at the Conference of Parties of the UN Framework Convention on Climate Change in Warsaw, Poland late last year. The Ghana Bamboo Bikes Initiative claims to address climate change, poverty, rural-urban migration and youth unemployment by creating jobs for young people, especially women, through the building of high quality bamboo bicycles. They explain on their website that compared to the production of traditional metal bicycles, bamboo bikes require less electricity and no hazardous chemicals. They say the bikes are light and stable, can handle rough terrain and can carry large farm loads and passengers. 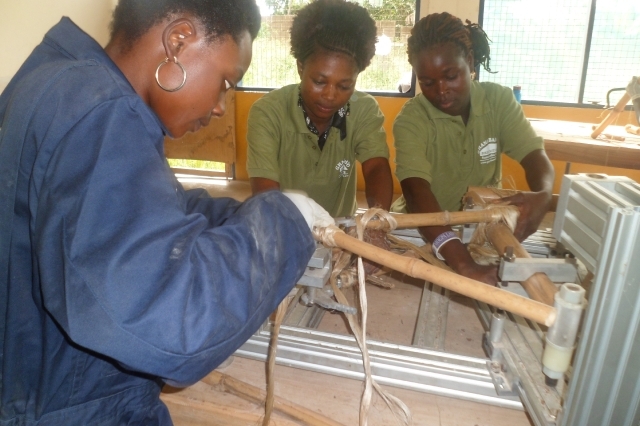 The woman-led Ghana Bamboo Bikes Initiative trains people, especially women, with little or no education in the manufacturing and assembling of bamboo bikes. The activity has created 30 jobs (10 jobs for farmers and 20 jobs for bamboo bike assemblers), and they were recently featured in a Rockefeller Foundation web story. Zambikes says that they exist to change lives in Zambia by developing and providing efficient transport solutions throughout the country. The vision of the company is to be the leading supplier of high quality and customized bicycles and accessories in the Southern African region, and this includes bamboo bikes. Their bamboo bikes are custom handcrafted by skilled Zambians, using locally grown and sustainably sourced materials. And the process to build a frame takes over 2 months. A similar initiative called Bambike is a socio-ecological enterprise in the Philippines that hand-makes bamboo bicycles with fair-trade labor and sustainable building practices. 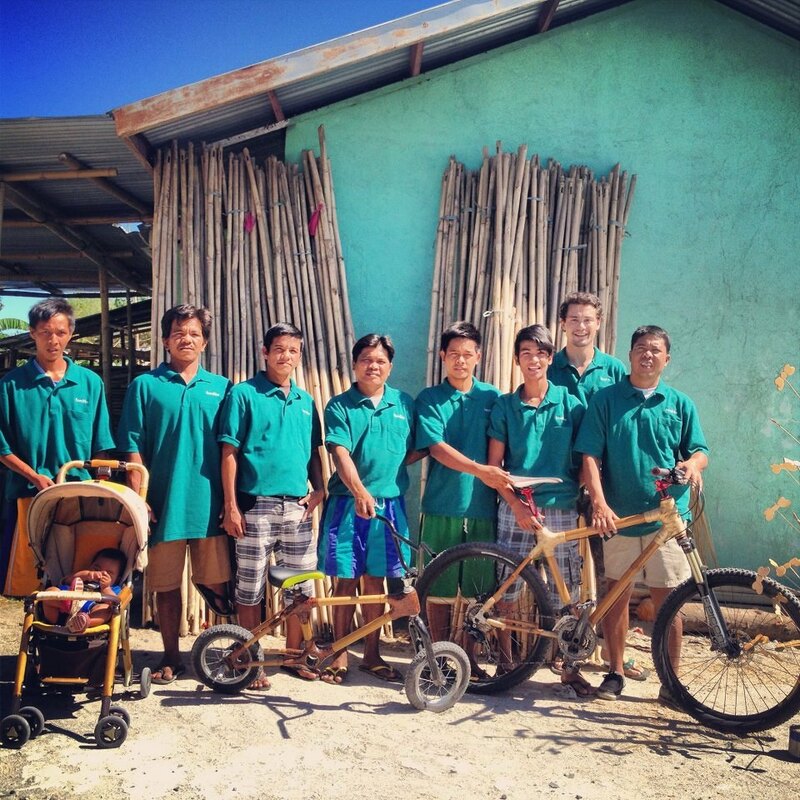 The Bambike builders come from Gawad Kalinga, a Philippine based community development organization for the poor, working to bring an end to poverty. Bambike says that it is also working on a bamboo nursery for reforestation and has plans for a scholarship programme. Their goal is to do better business and to make the greenest bikes on the planet. I have also seen a bamboo bike in the INBAR Regional Office for South Asia in New Delhi which is produced by our partner the Centre for Indian Bamboo & Technology (CIBART). Even the USA has bamboo bike manufacturers. A company called Erba advertises that riding one of their bikes made with natural fibers means you’re taking environmental conscience a step further – as bamboo is one of nature’s fastest natural growing resources, and the joints of Erba bikes are apparently made from plant-based hemp and flax. Bamboo bikes sell for two thousand dollars or more, so the market is small. I do not expect this to be a major development area for any of the INBAR Members, but bamboo bikes are very good publicity tools for the benefits of bamboo. I have listed a few of the better known initiatives, but there may well be others. Let me know and send photos if you are aware of other initiatives. On Saturday 8 March and Sunday 9 March, I visited Anji County in Zhejiang Province. 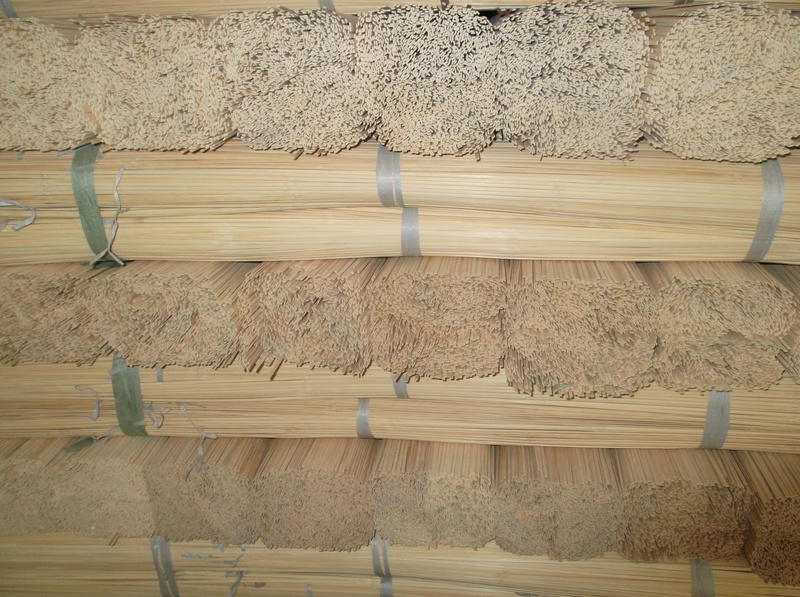 Anji County produces nearly 20% of China’s bamboo industry, and half of the annual income of the County is related to bamboo production. 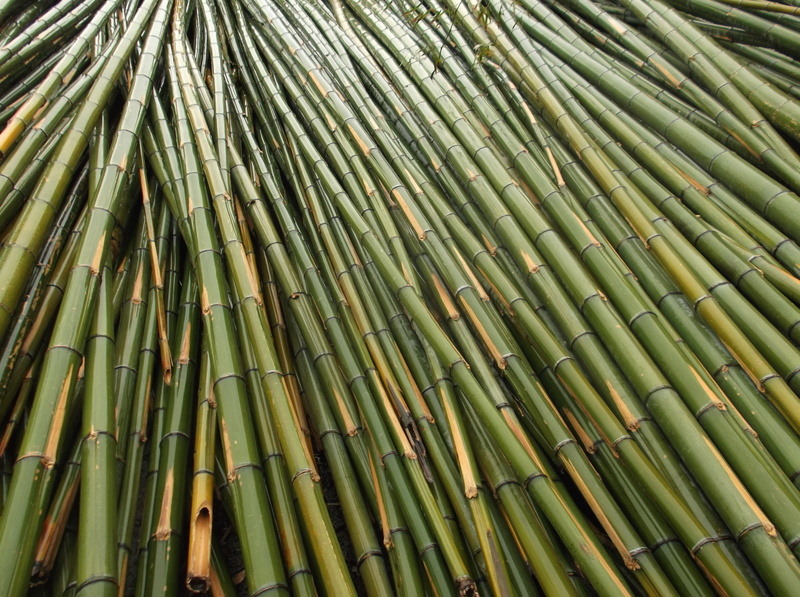 Bamboo has been used for thousands of years, and there is a lot of bamboo in the County. To put it into context: The famous fighting scene in the bamboo forests of the film Crouching Tigers – Hidden Dragons was filmed in Anji! To start the day, we visited the bamboo research station of the County Forest Service which is studying the most effective and efficient ways of managing bamboo plantations. They are measuring growth rates, density and other parameters, as well as air quality, CO2 and other conditions. 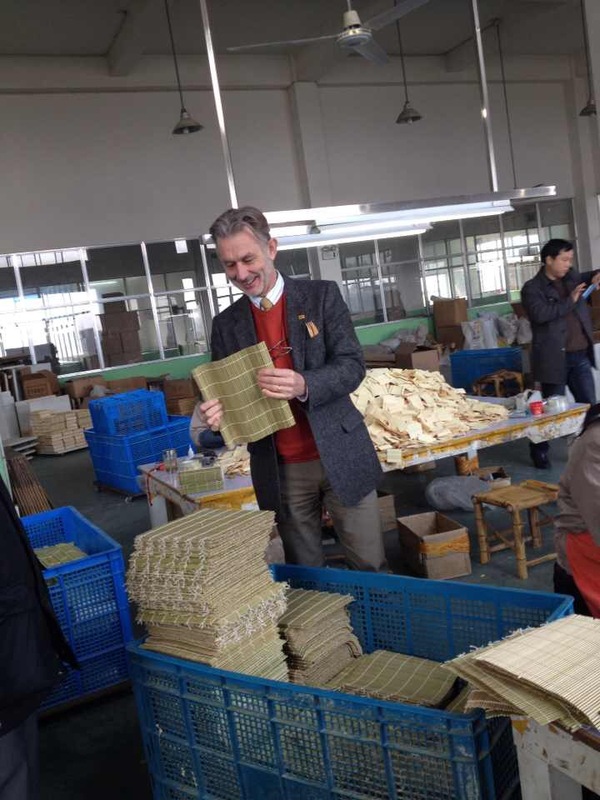 We then looked around a workshop that is specialized in splitting the cut bamboo poles into strips, which are used for either production of venetian blinds or for bamboo flooring. The side products of this particular operation are charcoal from the waste products and bamboo scaffolding from the top of the poles which are too small for splitting but very strong and flexible. The sawdust that is generated can be used for particle boards or for fuel to power the boiler. Finally, the edges of the strips that cannot be used for the primary purpose can be made into fibres for pulp and paper production. Nothing is wasted in the production chain! Afterwards, we visited one of the largest bamboo factories in Anji which produces top quality floor planks, wall panels, furniture and interior design. The products on display would take pride in any showroom in Europe or the USA, and the latest designs were in one word: brilliant. The company supplies a growing domestic market, but also exports internationally, including to well-known large international furniture companies. Anji has a wonderful bamboo museum with archeological discoveries, historical anecdotes, educational displays about bamboo biology, ecology and distribution as well as examples of traditional and modern use from China and the rest of the world. The introduction display describes bamboo as “a grass that does not act like a grass which looks like a tree but is not a tree”. The museum also has a small zoo with four very happy giant pandas that were munching away on bamboo leaves. They get occasionally an apple to boost their vitamin intake and I was lucky enough to feed the pandas. 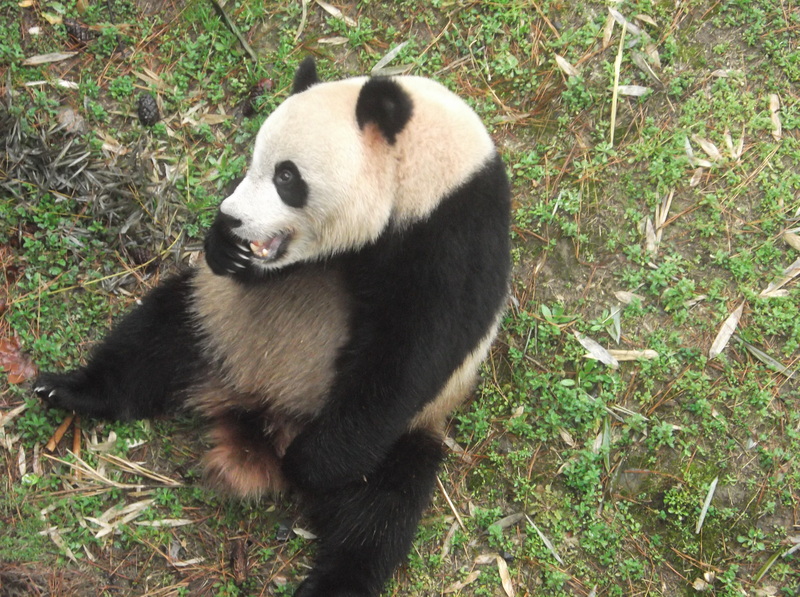 It was the first time that I have seen a giant panda in the flesh! 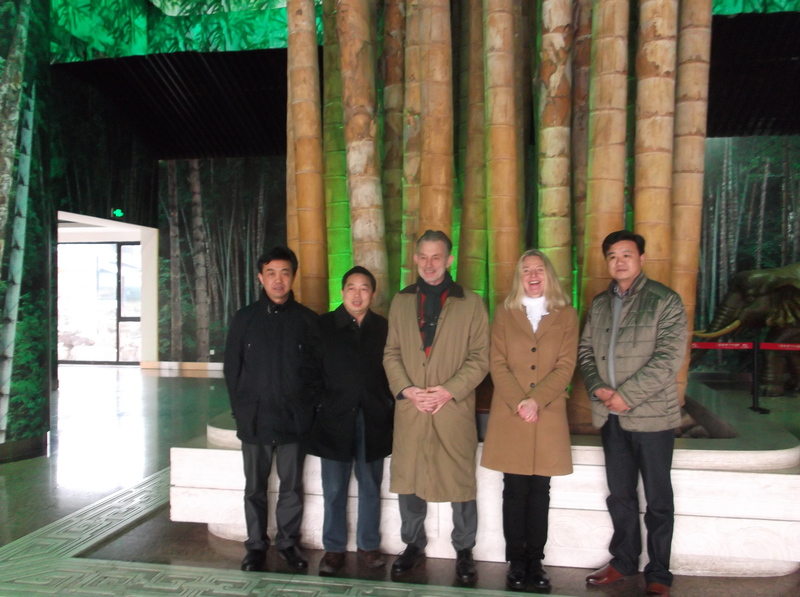 The following day we visited a factory that specializes in the production of textiles from bamboo viscose. The material is extremely soft, has very high water absorption capacity and apparently has anti-bacterial properties. Bamboo textile industry is one of the fastest growing aspects of bamboo the sector. Commercial application did not start until mid-noughties and after 8 years it is worth more than 10 billion Yuan. It is still not possible to produce textiles from pure bamboo fibres as they are too short, but I would not be surprised if further Research & Development may find a solution for this in the future. However, making textile from bamboo viscose still has important positive environmental benefits: growing bamboo instead of cotton means that less irrigated land is needed for cotton and therefore more land can be used for food production, and bamboo does not need the agro-chemical applications that are required for cotton production, thus reducing soil and water pollution. We also visited a trading company that buys handicrafts from a large number of small producers, often women who work from home. While this sounds like small-scale business, the company was loading a 40ft container for export to Japan, and this is not unusual. This is a multi-million dollar business. Anji County calls itself the centre of bamboo production in the world, and now I understand why.